On either the Payment page or the Review Your Order page in Checkout, enter the code exactly as it appears, in the box next to "Discount Codes and Gift Certificates." If your discount qualifies, it will be displayed in the payment summary.Only one Promotional Discount code per order will be accepted. At the register, present the Gift Card as you would any other form of payment. The amount you spend will be deducted from your Gift Card balance. You may check your balance at any GNC retail store or by calling a Customer Service Specialist at 1-888-462-2548. Before you attempt to check your balance using any of these methods, be sure to have your Gift Card number and PIN in front of you. Gift Cards can be redeemed through GNC retail stores. You cannot purchase a Gift Card using another Gift Card. If the amount of your Gift Card(s) does NOT cover the total purchase amount, you will need to pay for the remainder of the purchase with a valid form of payment. If the starting balance of your Gift Card is GREATER the total order amount, the remaining balance will be stored on your Gift Card account for future use. Gift Cards are non-refundable and are not redeemable for cash except as required by law. No sales tax is charged when buying Gift Cards. PayPal is an alternate method for purchasing your order on www.gnc.com. It enables any individual or business with an email address to securely send payments online. With a PayPal account, you can choose to pay with your credit card, debit card, bank account, or PayPal account balance for any purchase you make. Your credit card and bank numbers are never seen by the seller or merchant. Plus, you're 100% protected against unauthorized payments sent from your account. PayPal currently cannot be used by Customers with a Canadian shipping and/or billing address. PayPal is used to securely send payments over the internet. You can choose to pay from your PayPal account balance, a credit card, debit card, or bank account. 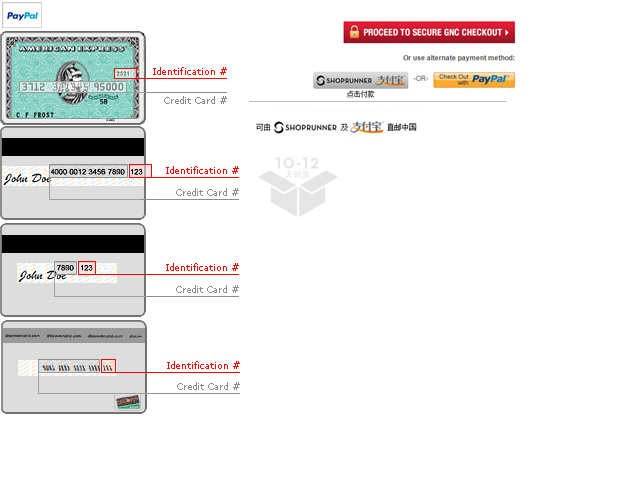 To make a PayPal purchase, select PayPal during checkout on the www.gnc.com website and choose your method of payment. Your funds are transferred immediately and securely. PayPal currently cannot be used by Customers with a Canadian shipping and/or billing address. Your identification number is the 4-digit number found on the far right on the front of your credit card. If you have any questions concerning your credit card's Identification Number and the benefits of using it for all your online credit card purchases with us, contact one of our Customer Service Specialists by phone at 1-877-GNC-4700. AliPay allows you to purchase directly from an official overseas website. What does this mean? With AliPay, overseas customers can place orders directly from official U.S. retailer sites and the products will ship directly from the U.S. to your international address. Because there are no middle men in this process, you can enjoy complete price clarity while getting guaranteed quality products. AliPay gives you the ability to pay for as well as track your orders. Professional international shipping that is faster, easier and safer is part of AliPay's advantage. AliPay also assists with the customs clearing process and ensures package delivery to your door. Is the price I pay similar to the U.S. market price? Because all of your shopping will be done via U.S. websites, the prices you will see are the same as a U.S. customer would see. Additionally, you will also enjoy the same real-time discounts and sales that are available for U.S. shoppers. Are the products from AliPay retail partners authentic? AliPay guarantees product authenticity, because all products come directly from U.S. retailers and are exactly the same as what U.S. customers purchase. The United States' strict legal system severely punishes any fraudulent activities to protect consumer rights. Are all of the products shipped from the U.S.? All U.S. partners of AliPay will ship products from the United States, so you won't have to worry about product authenticity or quality. After receiving orders, U.S. retailers will ship packages to our warehouse in the U.S. and AliPay will ship the products to China where the final delivery will be completed. Final delivery is also managed by AliPay. What language can I use to browse the websites? In order to ensure that the product quality and price is the same as what customers pay outside of China, all of our retailer partner sites are their official ecommerce stores. Therefore, all of the product information will be in English. How do I shop via the GNC AliPay platform? Once on GNC.com, browse through the site. The products that are eligible for ShopRunner Alipay Direct Cross Border Shopping will be indicated by the icon below. Choose the eligible AliPay items you want and add them to your Shopping Cart. Choose AliPay as the payment method in the shopping cart page. Use your AliPay account to log in and confirm your shipping address. AliPay will automatically calculate your shipping cost and any custom duty. Just sit back and wait for your package to arrive! Your purchase will be delivered in 10-12 days, but you can also log on to AliPay to check your order status in real time. Are there any product restrictions? Are there any restrictions on the amount of products I can purchase? Consider personal needs to ease the process, but restrict enough to deter smuggling or any other illegal activities. Due to this consideration, Chinese Customs has placed a 1000 RMB per package restriction (exceptions are made if only one product exceeds the limit). Package taxes will be calculated per Customs' duty percentage. If the tax is less than 50 RMB, no tax will be levied. If the tax is more than 50 RMB, tax will be collected. Therefore, in order to comply with the regulation, if you have more than one item per package and the combined value is more than 1000 RMB, our partner retailers will automatically ship and package your items separately. If any additional shipping charges result from the packaging changes, AliPay will calculate the additional cost for your verification. After you have confirmed your order, please click the AliPay icon on the Shopping Cart page to sign in with your AliPay account and complete your purchase. You do not have to provide your bank or credit card information to the U.S. retailers; all information will be processed through AliPay instead. AliPay provides you the easiest, safest and fastest way to pay. Your payment will only be released to the U.S. retailers after they have shipped your order. Do I use RMB or USD for payment? You can pay using RMB via AliPay, so you do not need a USD account. AliPay will convert the foreign currency to RMB based on Bank of China or China Construction Bank's daily conversion rate. How will shipping and duty cost be calculated? AliPay will automatically confirm package weight and item type in order to calculate the additional shipping and duty cost. You will have a chance to confirm all costs before you confirm your order. Any duty that was charged above and beyond the actual duty will be returned to your AliPay account within 30 days. How do I confirm that my order has been placed? After you have confirmed your order via AliPay, you will see a message stating that your immediate payment has been processed. If your AliPay account is linked with an email address, then you will also get a confirmation email from GNC and AliPay once your order has been placed. Click here to see how to add an email address to your account. How fast will my order be delivered? After you have placed an order with the U.S. retailer, the retailer will ship your order within 48 hours. The entire process of purchasing directly from U.S. retailers will take 10-12 days. Will I know the status of my order? Yes, you can check your order status in real time. To do so, log on to your AliPay account and check your order status under the "Placed Order" tab. If your AliPay account is linked with an email address, then you will also get email updates on your order from GNC and AliPay. Click here to see how to add an email address to your account. In which areas of China do you support shipping? When placing an order through AliPay, you will not need a U.S. address or freight-forwarding services. We accept shipments to all areas of China. Please make sure you have the correct shipping address selected in your AliPay account before confirming payment. Will my order be investigated or confiscated by Customs? AliPay will do all of the Customs clearing on your behalf. In order to minimize the chances of Customs inspection, we will scan all of our packages for prohibited items before shipping them to China. Because your order will be treated as imports for personal consumption, please limit your purchase within the scope of personal use. What is the delivery process like? You can use your AliPay account to track your order in real time. After your order has cleared Customs, the express delivery company will use SMS text or phone to contact you about the delivery schedule. What do I do if the items I received are incorrect or damaged? Call 86 571 95188 if in China. If outside China, dial 011 before the rest of the phone number. You may also contact AliPay Customer Service. What do I do if I want to cancel or return an order? The ShopRunner AliPay platform does not support refunds or cancellations, so please make your selections carefully. AliPay orders may not be returned to GNC or exchanged.